Jharsuguda : During the first day of filing of nomination papers for the upcoming general election 2019, total five candidates have filed their nomination for Jharsuguda and Brajrajnagar assembly constituency respectively at Jharsuguda Sub Collector Office on Monday. 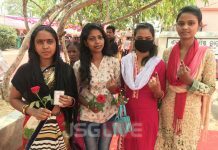 Among the five Candidates, from Jharsuguda Constituency, Jharsuguda Ex-MLA Naba Kishore Das, who had left Congress party and had joined BJD party, had taken out a massive procession from the Man Mohan M E School Ground to the venue of nomination. Along with his BJD supporters, he was also accompanied by his son Vishal Das and daughter Nikki Das. Subsequently, from Brajrajnagar Constituency, BJP MLA Smt. Radha Rani Panda, had taken out a procession from Kishan Chowk, Beheramal to the venue of nomination filing. However, in this election Congress party have allowed CPI to contest from Brajrajnagar Constituency. CPI’s Candidate Ramesh Tripathy had also filed his nomination. He was accompanied by Pradeep Debta, the MP candidate for Congress in Bargarh Parliamentary Constituency. In Last election 2014, Smt. Radha Rani Panda had won the Brajrajnagar Seat from BJP party, securing 50,736 votes by defeating BJD’s Anup Sai by 6,790 Margin of votes. Even in the last election congress had fielded Kishore Kumar Patel who had secured 38,175 and remained in third position. Subsequently, in the last election 2014, Naba Kishore Das who had fought election as a congress candidate secured 74,745 votes and had defeated BJD’s Kishore Kumar Mohanty by 11,563 Margin of votes. while Anand Pradhan of BJP party had remained in third position by securing 21,447 votes.